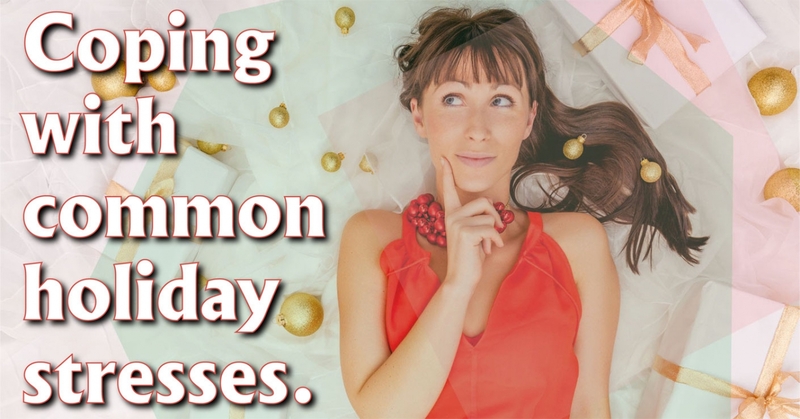 Coping with common holiday stresses. Stress during the holidays consumes many women. From standing in long lines to sitting in traffic, the most wonderful time of the year can easily turn into the most irksome time of the year. Adding to seasonal anxiety is the immense amount of pressure people put on themselves to avoid holiday weight gain. Yet, the pressure to resist temptation and empty calories often creates stress, which in turn can result in added pounds. Here are ways to keep weight loss goals in check while reducing stress now and in the year ahead using breathing, posture and visualization techniques. For the short term, be prudent about your goals. Putting too much stress on yourself to lose a ton of weight or maintain an unrealistic weight can backfire. Such anxiety releases stress hormones that make us crave sugary and fatty foods as well as triggers the body to store fat around the midsection. The average American watches four or more hours of TV each day. Following this sedentary lifestyle while being bombarded with food commercials is a recipe for weight gain. Watching television creates a snack environment. Most people are programmed to grab a soda, a bowl of chips or another snack to scarf down mindlessly while watching TV. Alcohol triggers the stress response and releases the stress hormone cortisol. It interferes with the quality of your sleep, can zap your energy for days and leaves you vulnerable to stress. Commit to working out for at least ten minutes every day. Optimize the results by incorporating cardiovascular exercise and resistance training into each fitness session. Give your breath a color. Envision and feel your breath moving down to your toes, whether sitting or standing. Exhale, and envision your breath moving upward from your toes, through your pelvic floor and continuing up the spinal column and out the crown of your head. Do this three times slowly to feel calm, grounded and centered. Standing or sitting, inhale while grounding into your feet or sit bones. Connect to your body’s center at the navel by inhaling and drawing your navel toward your spine. Exhale and lengthen your lower back toward your tailbone and your tailbone toward the floor. Feel your chest rise and your heart lift. Do this three times to feel energy rise up through your body’s center. Notice how you feel confident and solid in your body. Think of someone you are grateful for and send that person a loving prayer or blessing. See the joy on that person’s face as your prayer or blessing arrives. These simple but profound experiences make our lives pleasant and enriching. Start by noticing some people or faces nearby. Smile at someone, paying attention to how your body relaxes and your mental outlook shifts. Remember that generosity returns ten-fold and connects us back to our hearts. The next time you are standing in line or sitting as a passenger on a train or in a car, look over your right shoulder as if someone was calling you and keep your hips square. Deepen and guide your breath into the leg that you are twisting away from and feel your torso rotate from the base of the spine upward. Exhale as you arrive into the twist and feel the muscles around your rib cage and spine soften. Inhale again and imagine the body’s outer layer melting like wax down a candle. Meanwhile, lengthen the crown of your head upward. Exhale and rotate back to face forward again. Repeat these movements on the other side, doing everything in succession for three times on each side. Candace Morano is a certified yoga teacher and educational kinesiologist with a master’s degree in social work from New York University. Jenny Evans, BS, CPT, CFT, is an internationally recognized expert on stress, exercise physiology, nutrition and performance. She is the founder and CEO of PowerHouse Performance Coaching and creator of PowerHouse Hit the Deck, a product to combat stress and increase fitness. For further information, visit www.explorevidyayoga.com and www.powerhouseperformancecoaching.com.